Before I started my thru-hike last April, the issue of resupplying along the trail made me a little anxious. Where would I shop? Would it be expensive? Were there enough resupply stops to get what I needed, when I needed it? Once I started hiking my fears were eased as I realized a few things about resupply that only come from experience. I discovered how to fill my food bag (but not overfill it) for three to four days at a time. I learned how to shop quickly so I could spend time in town on other things. And I maximized my budget, often resupplying for less than $20 when other hikers were spending much more. Most grocery stores along the trail have savings cards that give you extra discounts. Before I left I signed up for accounts with Ingles and some others, but that wasn’t really necessary. Instead, when you check out ask the cashier if they can scan a guest card for you. This gives you the savings without worrying about opening an account or carrying a card. I had 100% success with this request when the store had a frequent shopper discount program. Sometimes hostel owners also had cards for their local groceries. If they offered, I would use those cards so they could get the points. It’s just a little way to pay it forward since they do so much for hikers. While it’s popular with a lot of hikers, Walmart was my least favorite resupply stop. This was partly because the store is huge and it takes forever to run from one side to another finding everything you need. The other reason is large packages and limited variety. If you can take a friend and split packages, you both win. If not, you’ll need to decide what to do with the half-dozen Pop-Tarts you don’t want to carry. I hiker-boxed a lot of food from Walmart. I didn’t mind sharing, but I did mind that my effective cost doubled if I could only get a large package of something when I needed just a few. As for variety, I found that things like my beloved Kind bars only came in two or three flavors at most Walmarts, while regular grocery stores often had six or more choices. You’ll find lots of Dollar General stores on the trail, and they’re OK for resupply, but Dollar Tree (where everything is a dollar) became my favorite. 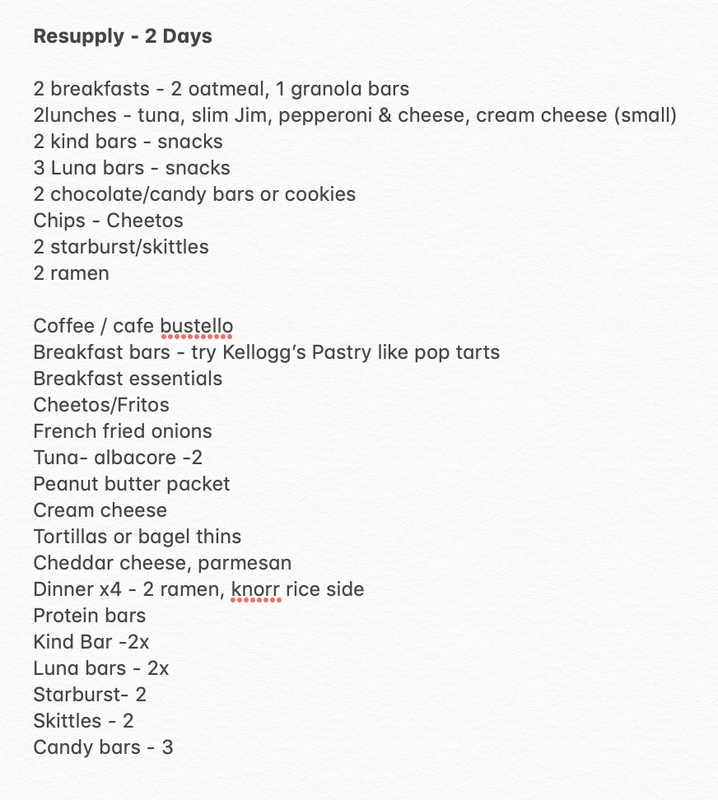 There were some items on my regular shopping list that Dollar Tree carries in four-packs, saving me from the multi-pack problem I had at Walmart and regular groceries. A four-pack of mini Slim Jims was a great addition to my snack bag, and the four-pack of Welch’s fruit snacks sure beat buying a ten-pack elsewhere. Ditto for ramen. Dollar Tree also carries lots of small-size items, again for $1. So I could pick up shampoo and conditioner or extra hand sanitizer for next to nothing, where I’d spend $2 to $3 each at other stores. One downside of Dollar Tree is that they don’t really meet the needs of a full resupply. They don’t carry fresh food and sometimes have a limited grocery selection. For this reason, I’d make Dollar Tree my first stop when I had the choice, then I’d round out my shopping at the local grocery store. One of my resupply shopping lists. One of my first town chores—or even better, pre-town—was to make my shopping list. I’d empty my food bag and take inventory of what I needed so I could shop quickly and not overspend. Eventually I started keeping a template list on my phone so I wouldn’t forget things. I’d add or subtract from this list as needed, then I could zip through the store, checking things off as I shopped. When I was bored with my food choices I’d get nosy about what my fellow hikers were eating. That’s how I discovered individual olive packs, which became a trail favorite for me, and avocados, which I never would have thought to pack out. Knowing what your friends like helps with collaborative shopping (see above). It also gives you a chance to trade items and sample new things before you buy them. It kind of stinks to pack out something you think you’ll like, only to find you can’t stand it. And you’re stuck eating it for days. Most hostels and many post offices have hiker boxes full of gear items and food that hikers (or trail angels) have dropped off. With your shopping list in hand, this is a great first stop before hitting the store. I often found several items I needed in hiker boxes, like oatmeal, Knorr Pasta Sides, and ramen. That saved me money and added a little variety to my dining options. You can also use the hiker box to rid yourself of items you bought but don’t like, or that you have too much of. Note: When using hiker boxes, be mindful of other hikers and don’t take everything. Lots of hostels have pretty good resupply options at reasonable prices. This is the place to get your fuel and toilet paper. You might be able to pick up a few zip-lock bags if you need them, or even a replacement trash compactor bag to line your pack. Hostel owners don’t get rich off resupply. You may pay slightly more for food items than you would at a store, but the convenience is worth it. This is especially true if you only need one granola bar or a single pouch of oatmeal. It’s really nice when a hostel owner takes you to a store and waits while you shop. If you can shop quickly, you show respect for their time—and you get time to do other things that are more fun! There were a few times when I was shopping with several other hikers and someone was way slower than everyone else. If everyone agrees, “We’ll meet at the car in 30 minutes,” be sure you’re there. Otherwise you risk irritating your fellow hikers, or worse yet, the hostel owner. Not everything in your food bag needs to be prepackaged, prepared foods. Add some fresh items for your first day back on trail or even for the morning you head out. I would almost always buy a banana for breakfast before I got back on trail. If I had restaurant leftovers, I’d pack them out, too. In fact, one of my best trail lunches was leftover fajitas from a restaurant in Pearisburg, with a little fresh bread from the Woods Hole hostel. 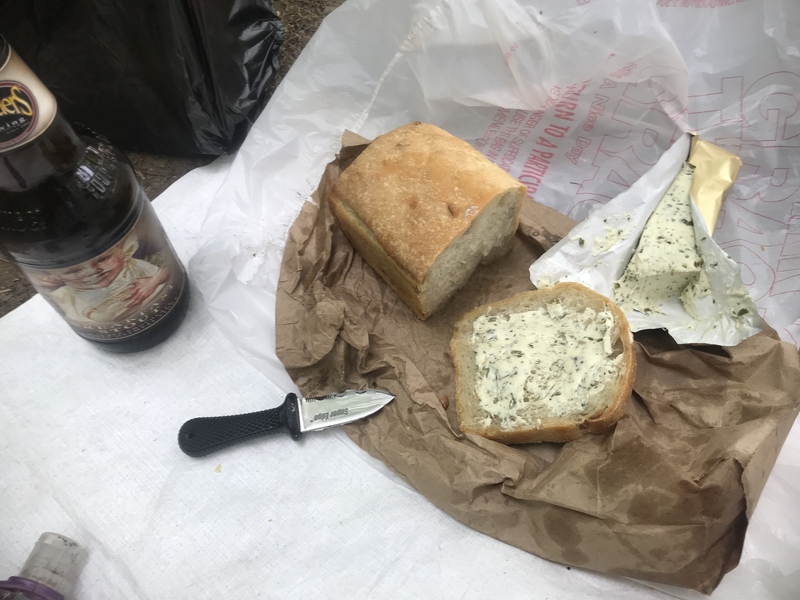 In White Springs, I stumbled on a local farmers market where I picked up some cheese and fresh bread. I added butter from a local shop and was in snack heaven for a couple of days. Some convenience stores stock locally made treats like cakes and cookies. These are always a nice addition to the hiker menu. I’m a planner, so I set myself up in advance with eight resupply boxes containing everything from favorite foods to razors and dry wipes. These boxes supplemented my shopping in trail towns, giving me access to things I needed in small quantities or items I couldn’t get on trail, like dehydrated meat. The olives I loved were hard to find in stores, but Amazon Prime delivered. They came in a 12-pack, so I split the box with another hiker and we were both happy. Amazon was also great for gear replacement, like when I needed a new bite valve for my hydration system. You don’t always find a good local outfitter in small trail towns, so I was thrilled to have Amazon ship items right to the hostel for me. With two-day delivery through Amazon Prime, I was free from having to plan ahead a week or two for a package to arrive. One caveat: if your package is coming via UPS, before sure you provide a street address. UPS can’t handle general delivery to a post office, so hostels were always my first choice for packages. There you have it. I hope my resupply lessons help you on your hike. Do you have other tips to share? Please include them in the comment box below. Very thoughtful advice, hoping to use it in 2020 or 21! I have done a smaller trail the 330 mile ALT, I enjoyed the half pound blocks of cheese. Thank you for this great information. I have enjoyed your”You Tube” videos. You are always encouraging and uplifting. The information regarding resupply is valuable and I will reference it as I prepare for my AT adventure. I am thinking of ordering MRE packages and sent General Delivery to myself along the way. 2017 Thru Hiker Here, Navy Veteran as well. MREs are already hydrated so they weigh more and aren’t good for the calories vs weight trade off. Waiting at post offices got old and most hikers just shopped in towns. One day we waited for the post office to open only to realize it was Sunday. Great list and I loved to find stuff in the hiker box that I would have paid for. Fresh bread, a local good looking spread PLUS Founder’s Breakfast Stout! Luxury, worth every sacrifice!! !